Just off a south-east London street stands one of the most important examples of Art Deco style in the capital. 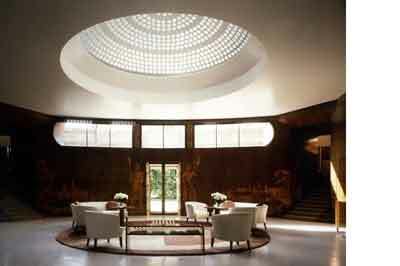 Enter the circular entrance hall of Eltham Palace and you could imagine yourself on a huge ocean liner resplendent with glass, panelling, clean curvilinear lines and expensive materials, their shine and gloss enhanced with disciplined ornamentation. Originally a manor house, it was acquired by the future Edward II in 1305 as a gift to his queen, Isabella. Edward IV added the Great Hall with impressive hammerbeam roof in the 1470s but 150 years later the palace was eclipsed by the grandeur of Greenwich and become a farm. 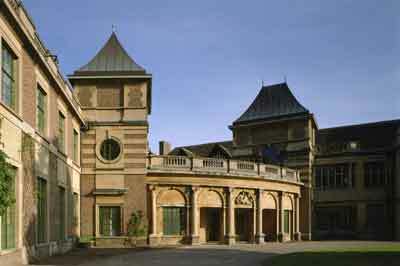 It took people with vision to see its potential and in 1933 Stephen and Virginia Courtauld, his family owned the Courtauld rayon business, acquired Eltham Palace, engaged young architects John Seely and Paul Paget and built a private house next to the Great Hall which they restored to use as a sitting and music room. 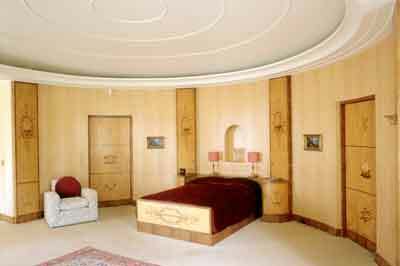 The rooms reflected the eclectic tastes not only of the Courtaulds but of their artistic advisers, the painters Winifred Knights and her husband Tom Mornington, the Swedish interior designer Rolf Engstromer and the Italian decorator Peter Malacrida. That the interior bears some resemblance to the passenger ship the Normandie is not surprising as Art Deco, not popularised as a name until 1968 when Bevis Hillier wrote Art Deco of the 20s and 30s, derives from an informal collective of French artists known as La Societe des Artistes Decorateurs. They organised the 1925 Exposition Internationale des Arts Decoratifs et Industriels Moderne from which the terms Style Moderne and Art Deco derive. Art Deco is based on geometrical shapes and the new age of travel which led to historical styles such as Greco-Roman Classicism and Egyptian being drawn upon as well as technologies such as modern aviation and electric lighting. Art Deco was also influenced by Cubism and Futurism. Its opulence can be attributed to a reaction against the forced austerity imposed by World War I. Every town had, but has now mostly lost, its Art Deco cinema, New York has the Chrysler building with its sunburst-design spire and the ocean had its luxury liners. 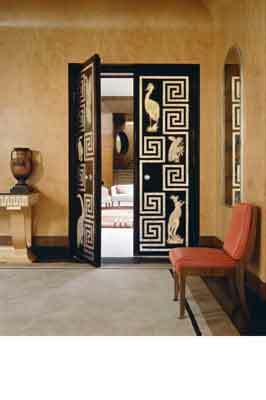 Materials included aluminium, stainless steel, lacquer and inlaid wood of which last there are some marvellous examples at Eltham Palace. The junction between the medieval Great Hall and the 1930s building is marked by a spiral staircase. The new house is entered via glazed double doors which lead into the vast entrance hall. This is triangular in plan with rounded corners and is lit by a 7m-diameter concrete and glass domed roof. The curved blackbean-veneered walls are inlaid with classical marquetry scenes and figures, the richness of which contrasts with the plain elegance of the tub chairs and curved coffee table. Access to the dining room is through spectacular black and silver doors featuring animals and birds drawn from life at London Zoo, a fancy that led the Courtaulds to keep a pet ring-tailed lemur in its own centrally heated quarters. Indeed, the house embraced modern technology, with a centralised vacuum cleaner in the basement, loudspeakers that broadcast records on the ground floor and an internal telephone system. This new country residence was inspired by Hampton Court Palace, and constructed to a butterfly plan, linking the medieval palace with the typical 1930s building style. Despite the conversion of the Great Hall to a sitting room, with new stained glass for the windows and new wall hangings, the hammerbeam roof and Minstrels Gallery have survived to evoke a sense of the medieval setting. The Courtaulds left the palace in 1944 to escape the bombs that were raining down in that part of London. The lease was taken over by The Royal Army Educational Corps until 1992. Although the building was well maintained, some damage was caused to the internal fixtures and fittings as furniture was removed and the veneered walls whitewashed over for the practical purposes of the Army. In 1995 the building passed into the guardianship of English Heritage, who spent the next five years restoring it to its former glory. Most of the original collection of works of art and furniture is no longer in the house, but 1930s furniture has been carefully replicated in the main rooms by the Warwickshire-based firm of NEJ Stephenson Ltd, see F and C 171. World War II had already brought an end to the expensive glamour of Art Deco but its influence is felt in the understated but crisply executed lines of some of the exhibition-quality pieces of today by makers like Huw Edwards-Jones, see F and C 164, who is sometimes influenced by Deco and ancient Egypt, and in the work of designers like Tim Gosling, see F and C 163, whose Deco-inspired furniture is based on Greco-Roman architectural and mathematical precision combined with a use of sumptuous materials. Then again, it could be said that something as modern as the use of carbon fibre as practised by Nicholas Spens, and aluminium honeycomb panels to allow heavy embellishments, as executed by Yannic Chastang, see F and C165, is very much in the spirit of Art Deco, embracing modernity with grace. 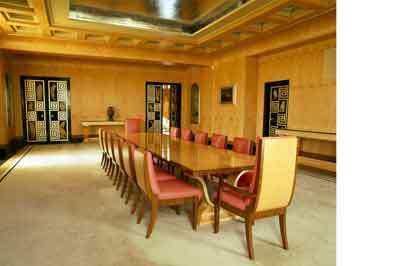 Eltham Palace is some 200 yards from Eltham High Street at Court Yard, Eltham, London, SE9 5QE. It is open from Sundays to Wednesdays at various times and closed from 31 December to 31 January.